This year (2017), Black Friday was huge for online shopping, and Cyber Monday managed to be even bigger, making Thanksgiving Weekend feel like the calm before the storm. Not surprisingly, this trend has only been growing in the last few years, so I decided to discuss the importance of the 1st and 2nd biggest online shopping days of the year, specifically for WordPress plugins & theme sellers. My goal with this piece is to bring forth data to help you see why any seller of premium WordPress plugins or themes, who’s not doing anything to increase sales during BFCM, is leaving a LOT of money on the table, plain & simple. 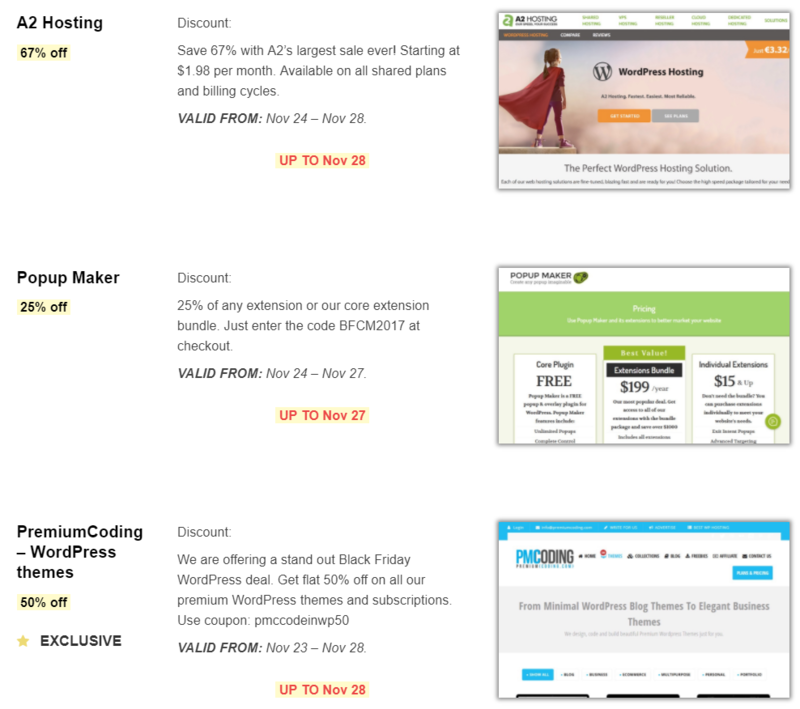 If you’re using Freemius to monetize your WordPress plugins or WordPress themes you are probably on our closed “Freemius DEV” Slack channel, where a few days before Black Friday we announced we’ve extended the Freemius checkout service to support coupons auto-activations, just in time for our sellers to introduce some kickass BF/CM promotions for their premium WordPress products. A Drastic BFCM-related Bump in Revenues? Better Believe It! 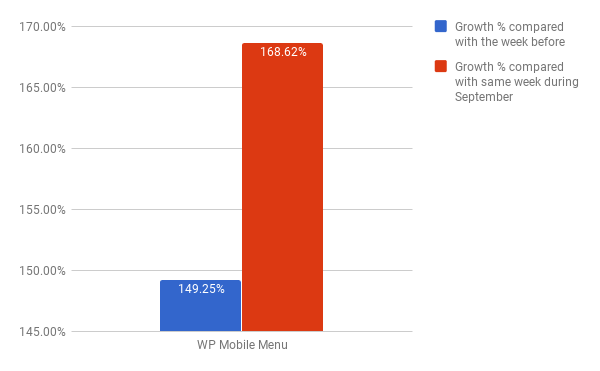 Now, after all the consumer craze had settled, I would like to take a look back and see what those special promotions did for the WordPress plugin & theme sellers who’ve decided to take advantage of them. We’ll look at data pulled from products sold by several sellers who have agreed to share their revenues percentage increase. We defined Black Friday & Cyber Monday as a week: November 23rd – November 29th. I realize, of course, that Black Friday occurred on the 24th and Cyber Monday was on the 27th, but we went with a slightly bigger “radius” than that, due to the fact that many sellers have launched their special promotions a bit sooner and also extended them a bit longer, to provide a larger time frame for their customers to shop. We compared sales & revenues of those products with their stats from the same dates during the month of September. Why? Because everyone knows that many buyers plan ahead of time, and keep their credit cards tucked during the 1-2 weeks (or possibly more) prior to those big sales days. That said, for products that did not exist on the Freemius platform (or on the internet) back in September – we will expose the comparison of BFCM stats against their revenue increase from a week before, as well. It’s easy to see that, all 3 Pootlepress products that offered BFCM promotions saw an astounding increase in revenues during that week (November 23rd – November 29th). Remember that when talking about a percentile growth of 100% we’re actually saying that revenues effectively doubled (and the growth was much bigger than that in most cases). Also worth noting is an unusual trend that we’re seeing across all of Pootlepress’ products, which is opposite to what we’d expect: we see a larger increase in revenues during BFCM when compared with the same dates during September, than what we see one week prior. This means that revenues were higher one week prior to BFCM week than they were during the same week in September – as we’ll see this is an anomaly when compared with statistics from other sellers, the reason being that customers are usually preparing for those special promotions, and are therefore less inclined to purchase products just before the big sale begins. 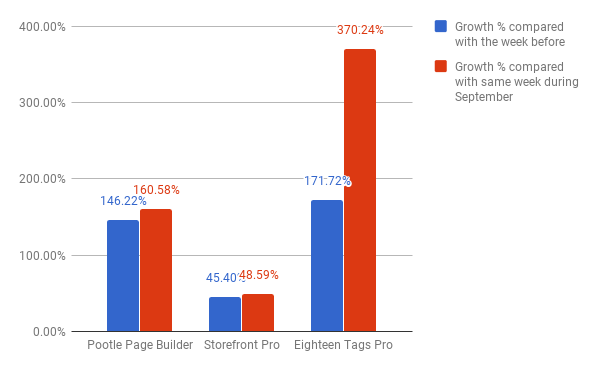 I’ve asked Jamie about this, and he suggested it might be related to the fact that PottlePress had distinctly increased its marketing and communication efforts with their users during October / November compared with their efforts during September. 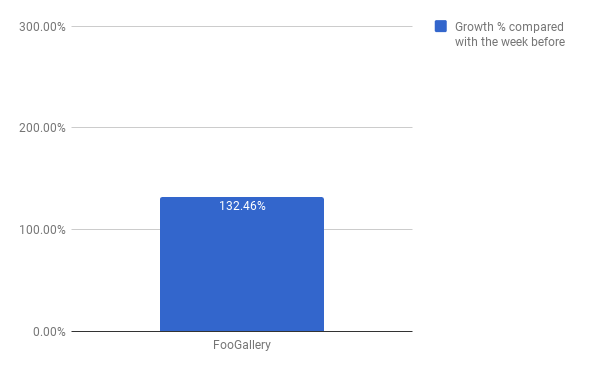 As is visible in the chart, I was only able to compare FooGallery’s growth percentage from the BFCM week with its revenues from a week before that. Revenue stats from September are unfortunately not available because FooGallery only migrated from selling add-ons with EDD to selling a Pro plan with Freemius during November. Nonetheless, this is some seriously impressive revenue growth during Black Friday & Cyber Monday (132% growth means they more than doubled their sales) for this image slider plugin. Apparently, the star rating plugin did nothing other than **email their active free user-list about the special Black Friday sale they were having, and yet, almost doubled its revenues during the BFCM week, when compared against their performance during the same dates around last September. In this case, as expected, we can see a much larger growth percentage when compared with the week before BFCM, which tends to usually demonstrate a lower revenue stream. Go to ‘Users’, modify the filter to ‘Active’ and you will get a downloadable CVS file containing your users’ details (if you have under 10k of them). Use the Freemius ←→ MailChimp integration to maintain an up-to-date list and email that segment directly. The trend when comparing IconicWP’s product sales and revenue during the BFCM week to the two periods is incoherent and a little confusing, but nevertheless, all products show a radical growth in revenues during Black Friday & Cyber Monday week, no matter how you look at it. Additionally, one of their products, ‘Attribute Swatches’, saw no revenue increase at all on the week before Black Friday / Cyber Monday. Since we are dealing with sellers of digital products, namely WordPress plugin and themes, there’s no physical preparation that needs to take place in the store, especially for those consumption fever days. Unlike stores that sell physical products, online sellers of software licenses do not have to stock up on inventory. Obviously, another software copy does not occupy more room on a shelf and does not need to be pre-ordered to the store in order to handle the spike in demand. So, what can you do to better prepare a WordPress plugin/theme store for BFCM? 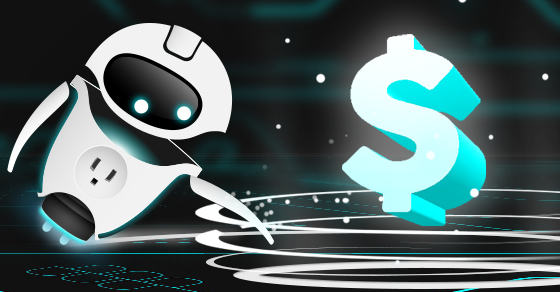 Definitely do NOT wait for BF day or CM day to uncover the special promotion on your website! You should mention it much sooner than that because people will be expecting it and websites/blogs will be preparing shopping lists for their readers. 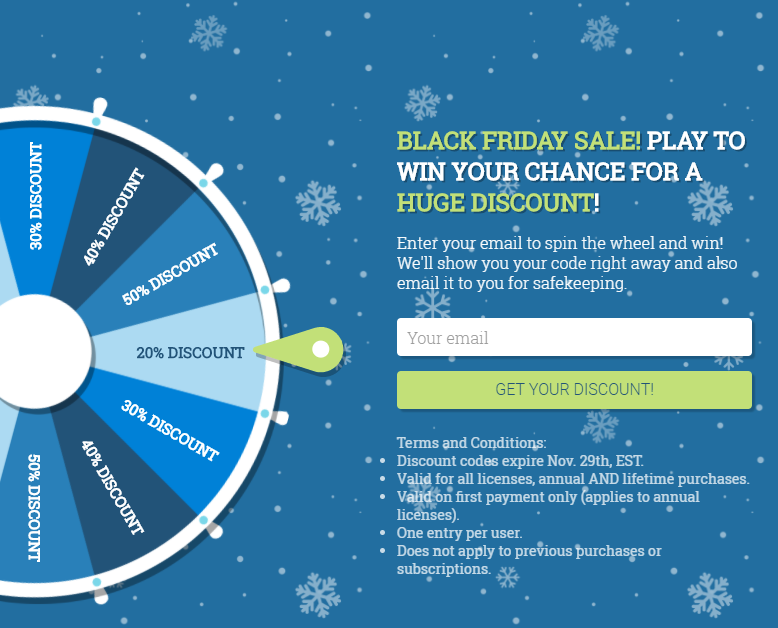 Try to figure out which of the big player/high traffic websites in the WordPress sphere are doing a massive collection of special Black Friday / Cyber Monday offers and hop on their wagon. We’ve all come across those huge promotion lists that start getting published about 1-2 weeks prior to BFCM – some of them can drive serious traffic and potential customers to your website. People who check those collections are looking for those deals, so why not be there when they’re looking for you? Something that can increase your odds of getting in those lists is to offer an exclusive deal for their visitors. Possibly add another 5% discount on top of your regular Black Friday promotion. Add a special promotional bar at the top of your entire website, so that every visitor pays attention to it and becomes aware of your upcoming special offering on Black Friday and Cyber Monday. Your pricing page/section is a great place to let potential customers know about your special BFCM promotion. Highlight it and be sure to show the scratched regular price, next to the bold discounted Black Friday deal. 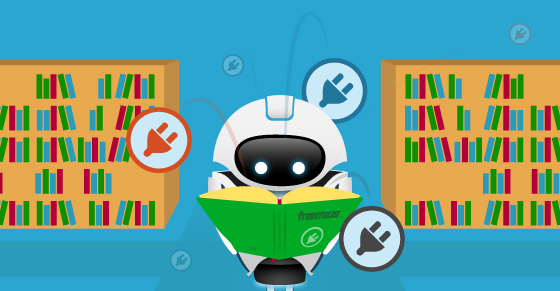 It’s easy to generate multiple discount codes for such sales promotions, so the FooPlugins guys made use of that to spice up the process for their prospects, keeping the minimum discount at 20% (so even if you get the lowest possible discount you still get to feel like you’ve saved a few bucks). I can imagine that at least several people opted in just for the kicks of spinning the wheel, so even if not all of them ended up purchasing the plugin – FooPlugins have their email address for future marketing. Everyone’s inbox gets bombarded with special promotions and sales right before Black Friday, and there’s a good reason why sellers do that – it works. 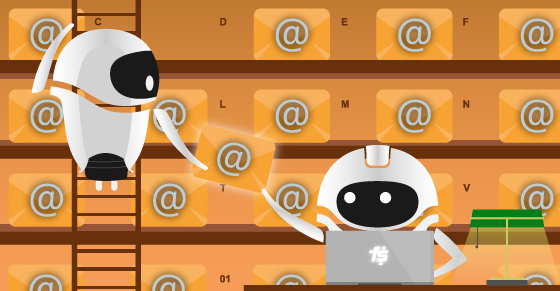 So, don’t get left behind on sales – do your email marketing portion. My recommendation would be to not overkill this medium! Don’t harass and upset your free users/subscribers too much with this. I’d say one email ahead of Black Friday, and another one just before Cyber Monday should do the trick. Not enough? Ben Pines spilled out a few more slick ideas on how to boost your Black Friday / Cyber Monday sales. Maximize The Potential of Your Black Friday / Cyber Monday Promotions – Make Those Shoppers Come Back for More! After you’ve gone and set up your BFCM promotions and brought in so many new customers – take advantage of it to do some quick tweaks in the shopping experience on your site to help make sure those consumers return a second/third time, to purchase more of your products, not only on special shopping days. To be on the safe side and make sure you’re not losing any potential customers/purchases – be sure to offer multiple payment frequency options on your pricing page. Visitors who are new and have not yet had the opportunity to perceive the value of this purchase can go with the less obligating monthly (recurring) payment option, and then upgrade to annual after 1 month if they so desire. When you pay for it on a monthly basis, it reminds you to go and make use of it, and, as a side effect, it also reduces the chances of canceling the automatic renewal. You should always provide greater discounts to existing customers. They have already bought from you once or more and they definitely deserve a reward that’s better than anybody else! the more customers buy, the greater the likelihood of them buying again. Years ago, when I made my first online purchase of t-shirts on the Threadless website, I remember I restricted myself to only 2-3 t-shirts, even though there were many I had liked on their site at the time. The reason was related to the fact that it was my 1st time purchasing there, and that I was not sure about their sizes and how they would fit me. Since then, I’ve returned to shop on their site multiple times already, mostly because they frequently email me, as an existing customer, with cool promotions and special discounts. I’ve already discussed the importance of collecting your users’ email addresses from day 1, so I won’t go into details here again. Suffice it to say that email is still one of the best communication channels that are available to you as an online product seller. Use it wisely, but definitely use it! Remind your users/customers about your existence by offering special discounts and telling them about slick new features or related news. 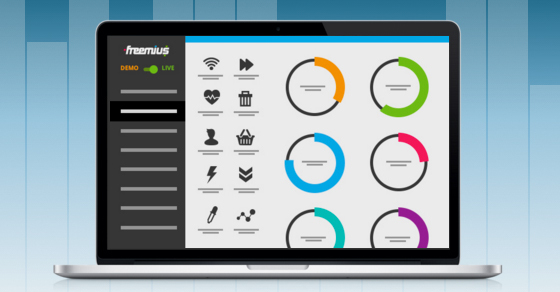 If you’re looking for an easy way to collect your free WordPress user’s emails – Freemius Insights can do that for you. Every visitor that arrived at your website due to Black Friday or Cyber Monday promotions is already a great reason to party, even if they didn’t end up buying anything from you. Why? Because of retargeting (AKA remarketing). The idea behind retargeting is quite simple: plant a cookie-based retargeting pixel on your visitor’s browser, which will allow your ads to “follow” that visitor wherever they may roam around the web. While it may sound a bit spooky – it is a totally kosher way to target people who are already familiar with your brand/products and have recently demonstrated their interest by visiting. The conversion rate is usually higher among retargeted traffic, in comparison with ads displayed to an unfamiliar audience. Almost anyone who has done it will tell you that Black Friday and Cyber Monday promotions will boost your revenue chart. 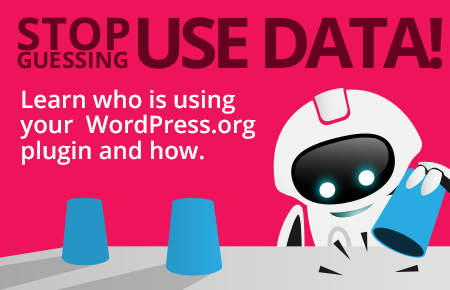 Hopefully, I was able to demonstrate that with the data relating to several premium WordPress products sold through Freemius, as well as provide some helpful tips on how to do it well. With that in mind, is there any reason not to go ahead with those special promotions? Well, yeah, if you want to avoid the stress involved with all of those customers “marching” into your store and demanding things all at once 🙂 (you might even get to enjoy the inertia of people storming shops, just because it’s Black Friday, and not even noticing you’re not running any special sale) but, other than that, I don’t see a reason not to. Whatever you choose to do – don’t forget to track the results (share them with us in the comments section below) and learn for next time.